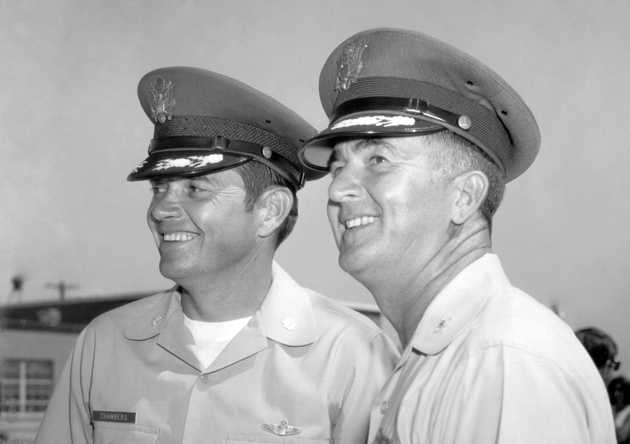 Maj. Gen. Donald E. Morris (right) pictured here when he was a colonel and the commander of the Tucson unit. Maj. Gen. Wess P. Chambers (left) was Morris’ vice commander and later served as the group’s second commander. Retired Air Force Maj. Gen. Donald E. Morris, 92, died Tuesday, June 7. 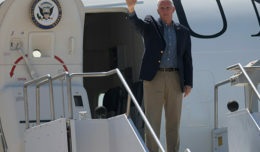 He is survived by his wife Cherie, two children, two grandchildren, five great grandchildren as he leaves behind one of Arizona’s greatest military legacies. 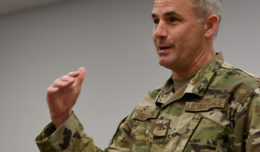 The Arizona Air National Guard’s 162nd Wing, owes its modern-day success and mission capability to Morris, the unit’s first and longest serving commander. 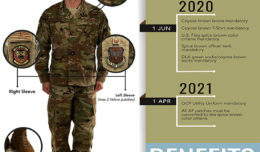 Morris’ 15-year command, from 1956 through 1971, laid the foundation for the Arizona Guard unit, which today boasts a robust international F-16 pilot training mission with more than 70 high-performance jets, a remotely piloted aircraft program with persistent combat and reconnaissance capability, an alert mission ready to respond at a moment’s notice to protect our region’s airspace, and a strength of more than 1,700 Airmen. At the age of 33, and at the rank of major in 1956, Morris moved from an Air Guard unit in Phoenix to start a squadron of F-86A Sabres at Tucson Municipal Airport. He was one of a dozen Phoenix Guardsmen tasked with the job of creating an interceptor mission out of a farmhouse and an empty dirt-floor hangar. Within weeks he built the 152nd Fighter Interceptor Squadron to 15 officers and 80 enlisted Airmen – a sign of what he would rapidly accomplish during his command. As an 11-year-old growing up in Fairview, Okla., Morris talked his way into as many airplane rides as he could. In the midst of World War II, a recent high school graduate in 1941, he joined the Army and served as a drill instructor while waiting for a pilot slot in the Air Corps. By 1945 he earned his wings and was teaching American pilots to fly the T-6 Texan at Luke Field. After the war, he joined the Arizona Air National Guard in Phoenix where he flew the P-40 Warhawk and the P-51 Mustang. In 1948 he became the first Guard officer to graduate from jet transition school. At the start of the Korean War he was called upon again by the Air Force, this time to train pilots at Nellis Air Force Base, Nev., in the F-80 Shooting Star, F-86 Sabre and F-84 Thunderstreak during a two-year activation. Following his release from active duty in 1953, he returned to the Air Guard and served as operations officer and later the commander for the well-established 197th Fighter Interceptor Squadron in Phoenix only to soon take on the challenge of starting a new one in Tucson – which would go on to be his enduring legacy. To the people who served under him he was simply known as “Mo.” They recall that he was an excellent pilot and that his leadership style was quiet and unassuming. Any task would be accomplished if he simply mentioned it in passing. General Morris led his Airmen through change and growth on a level that far exceeds what modern commanders experience. During his tenure, Tucson’s Airport saw F-86s, F-84s, F-100s, F-102s and back to F-100s. The base underwent numerous upgrades and construction projects to accommodate the ever-changing flying mission. Early on, he had a vision of converting the unit’s mission to pilot training. He could see that the unit’s air-defense duty wouldn’t last. He routinely traveled to the National Guard Bureau to talk about the unit’s future, and he was well thought of among Guard leaders in Washington. Toward the end of his tenure in 1969, with the Vietnam War at its peak, the Air Force asked General Morris’ group to change its mission from F-102 air alert to F-100 fighter training. The change was pivotal as the training mission continues in Tucson to this day. By 1971 Morris had earned the rank of colonel, the 162nd swelled to 1,000 members, and the number of personal, and unit, accolades was too many to mention. Later that year he left the unit he had raised from a dirt-floor hangar. Maj. Gen. Don Morris earned his first star as a brigadier general commanding the Arizona Air National Guard from its headquarters in Phoenix. Later he earned his second star and became the special assistant to the Southern Command in Panama and the U.S. Air Forces in Europe. Over the span of his 39-year military career he compiled 9,000 flying hours; 5,200 of which in jet fighters, 1,500 in the P-40 and P-51, 1,000 in multi engine aircraft and 1,300 in numerous other military and civilian aircraft. His major awards included the Distinguished Service Medal, Legion of Merit and the Air Force’s Order of the Sword, a special award presented by noncommissioned officers recognizing individuals they hold in high esteem. General Morris retired in 1983 and chose to return to Tucson. “It’s where some of my most fond memories are – the Tucson Air Guard and the people who have served there,” said Morris at the unit’s 40th anniversary in 1996. For Morris, and the fighter unit he created, life and work were always about family. His son Don Morris, Jr. and his grandson John Morris both served in the 162nd as have many of Tucson’s fathers, sons and daughters. To many he served with he was like an older brother or a second father, to all he served with he is regarded as a visionary Airman, Guardsman, leader and friend.